"The best promotions in the business"
"Customer support is nothing less than the most efficient and professional in the industry"
PLAY NOW AT CLUB WORLD CASINO! Club World Casinos is an organization which own 9 linked brands which work under the ‘Club World’ banner. This is a long running brand which has adapted to the changes in the industry, and looked after their players well. Club World Casino use Real Time Gaming software, offering around 120 games to their players. You’ll get regular bonuses at this casino, including a $777 welcome bonus to get your bankroll off to a great start. This review gives you a detailed overview of Club World Casino. First of all below you will find out about the games on offer. This begins with table games, and then looks at the extensive slots collection, plus novelty and other games. After that, the bonuses are the main topic, this includes the welcome bonus offer, plus ongoing and extra benefits of playing at Club World too. Finally, some notes specifically for US players on getting your money on board are looked at. This casino has undergone a lot of changes over its history, and today uses the solid (if unspectacular) Real Time Gaming software package. The number of games at 120 is a lot lower than at many of the international casinos – which combine software to offer 500 or more titles. While the RTG games look a little plain compared to the latest innovations, what they excel at is being entertaining and very playable. Table games give you at least one of all the main favorites, and often two or three. There are more versions on the Windows Download version of this software, compared with the in-browser instant play software. You’ll find Blackjack, Roulette, Baccarat, Craps and several different casino poker games here with several choices of table in some cases, the betting limits for table games start as low as just $1 per hand. You will also find that many games include side-bets which have the potential for much bigger payouts than the main games. There are more slots in the RTG software suite than any other game type. Most of these are 5-reel video slots. These incorporate Wild symbols (which can substitute for the others) and Scatter symbols (which win prizes wherever they land on the reels). Many games have free spin rounds or even more entertaining bonus features, which are like mini-games all of their own. One thing that really makes the RTG slots you’ll find at the Club World Casinos stand out, are the ‘random progressive jackpots’. There are two types of these. The first type is linked between the 100’s of casinos which offer these slots to their players. This means they grow fast, and can often reach more than $1,000,000 before paying out. The other is a smaller jackpot type which is based around the individual machine. What they have in common is that they can drop at any time, even if a random collection of symbols appear on the reels for that spin. The random nature of these jackpots mean you literally never know when the big one is going to drop. In addition to the slots and table games you can find other types including keno, bingo and Video Poker. You’ll have a choice of a slots or table games bonus when you first join Club World Casino. This feels like a much more straightforward way of organizing things compared to other casinos. Often you will get complex terms and conditions to pay different amounts for the different games. Here it is very easy indeed. 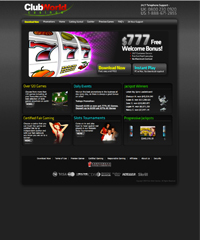 Slots players get a 100% match up to $777, table games players get a 100% match up to $100. There are coupon codes for each of these, which you will find on the Club World Casinos homepage. The table games bonus has a 30 times wager-through requirement. You should note that Baccarat, Sic Bo, Craps and Roulette bets do not count and other games may also include weightings. The slot bonus has a more manageable 20 times wager-through. Like at most casinos, the bonus chips themselves cannot be withdrawn, once you have met the wager-through requirements, you are free to cash out the winnings. There are a lot of other offers at Club World, including daily deals (reloads and promos), plus Jackpot comps, VIP Rewards and slots tournaments. International players will have no problems choosing from a long list of possible options. For US players, things are more limited at the moment. Club World Casino will accept all 3 of the main deposit methods, and have a minimum of just $21 for deposits. My recommendation is to try your Visa or MasterCard first. These get processed first time very often, using international purchase codes. Pre-paid Visa or money transfer services like Western Union are the alternatives available.